At midnight in april the constellation of Ursa Major is still overhead for northern hemisphere observers. 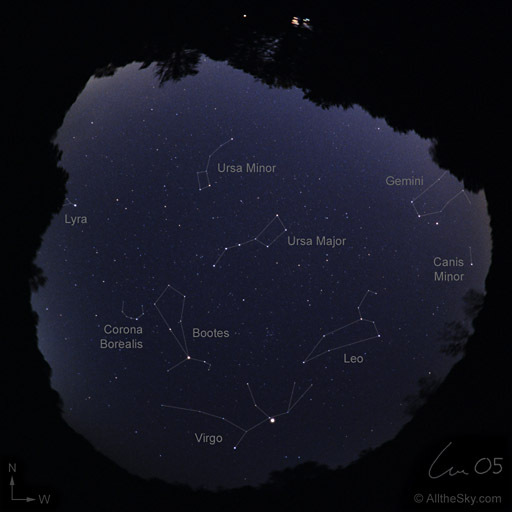 The last winter constellations Auriga, Gemini, and Canis Minor are visible in the western sky and the prominent summer constellation Lyra is rising in the east. Virgo with its brightest star Spica just has reached its highest position in the southern direction. The image of 2005 shows the planets Jupiter in Virgo and Saturn in Gemini.